Press release and interview from October 2017. The current library building was completed in 1997 when library design was on the cusp of change. Although radically different to the former Library building which was designed in the 1960s and which hadn’t aged well, the new building didn’t allow for flexibility. When the new Director arrived in 2008 they very quickly identified with the University’s Executive Team that the Library was no longer fit for purpose and needed investment to bring it into the 21st century. The refurbishment was managed in 3 phases, with the first phase being completion of the ground floor in summer 2012. This led to different ways of working for the front of house team and a much improved experience for students accessing library services. 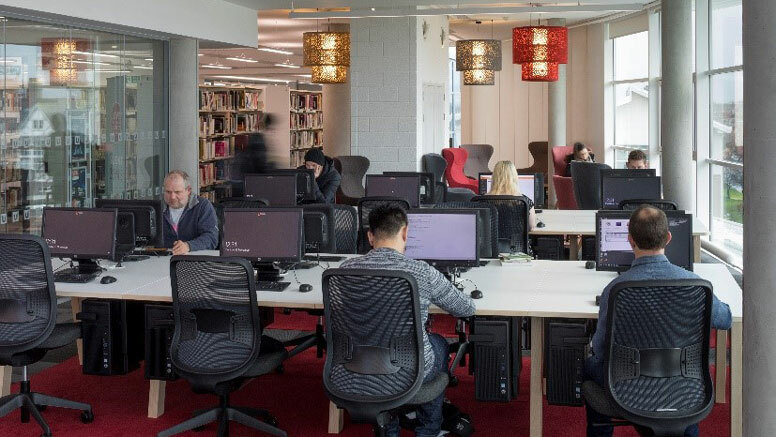 The second phase during summer 2016 focused on the 1st and 4th floors, creating vibrant collaborative spaces on floor 1 and a purpose postgraduate space on floor 4. This phase also saw the installation of windows in all four corners of the building on floors 1-3 where there had previously been solid wall. This had a huge impact on the quantity of natural light flooding into the building. 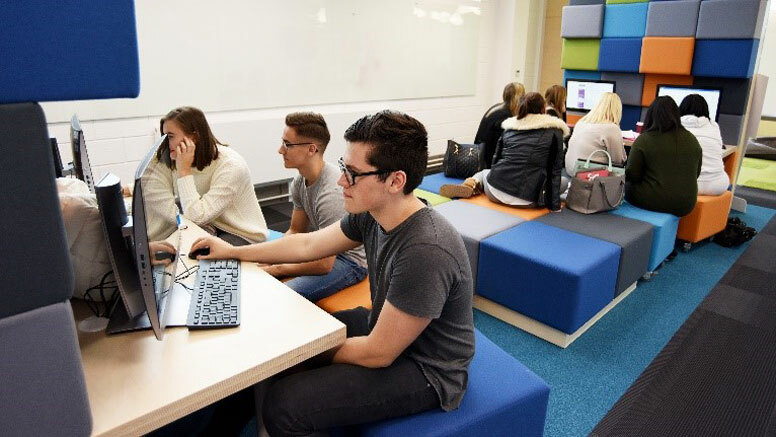 The final phase, completed in summer 2017 focused on floors 2 and 3, creating a quiet study area on floor 2 and a silent space on floor 3, both with a range of technology available to students as well as accessible learning spaces throughout. Throughout Teesside’s refurbishment journey, students were asked to feedback about the refurbishment, what they liked, what they didn’t like and what they’d like to change. 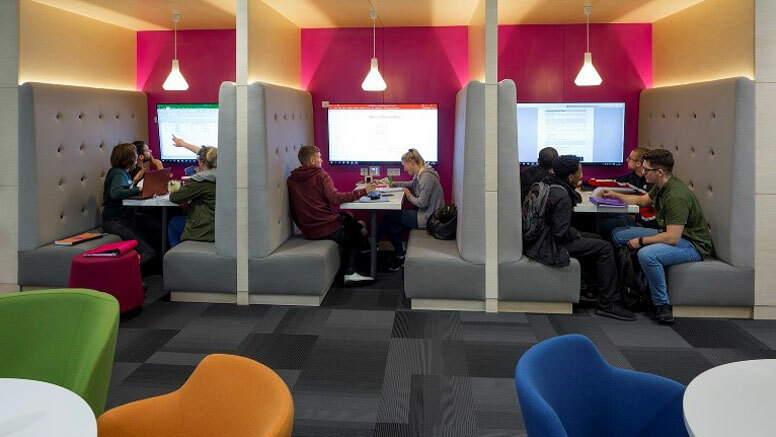 The team used graffiti boards and social media to gather feedback, working collaboratively with the Student Union and the feedback was fed into the subsequent phases of the refurbishment programme. The building was originally designed by FaulknerBrowns and opened to students in 1997. The building was predominantly breeze-block and there was a lack of natural light. 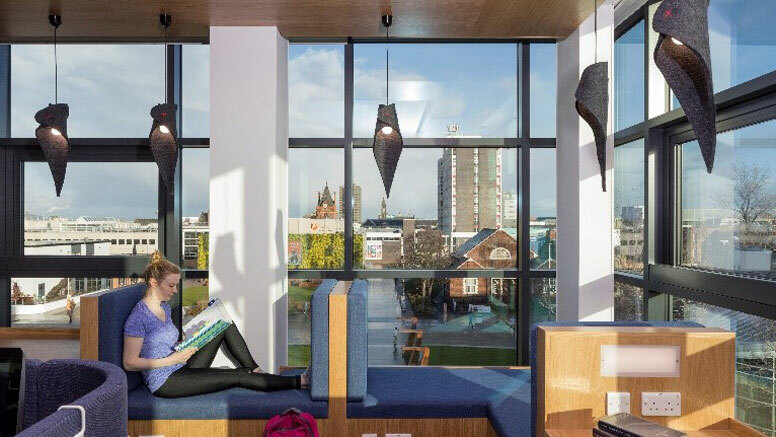 As part of the 2016-2017 refurbishment programme, windows were added to the four corners of the Library, floors 1-3 which has hugely improved the natural light flooding into the newly refurbished study spaces. The refurbishment is themed by the four seasons which has made the design a successful one. The ground floor had been refurbished as part of an earlier phase and has a “spring” theme and uses lots of greens and bright colours. 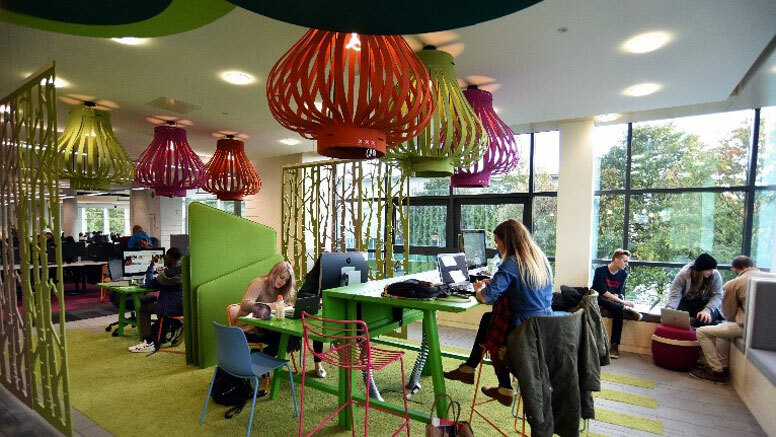 Floor 1 refurbished in summer 2016 has a “summer” theme and is extremely bright and uses colour to showcase some very creative spaces. 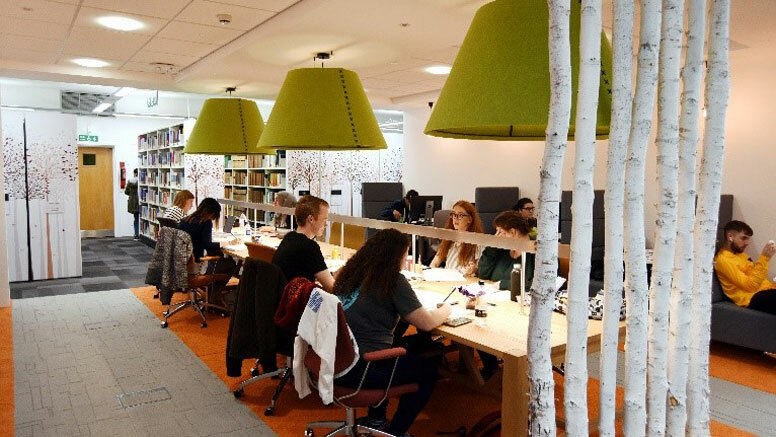 Floor 2 has an “autumn” theme and uses colour and texture to provide some excellent quality study spaces, for example the use of real silver birch around individual study spaces just off the central atrium. 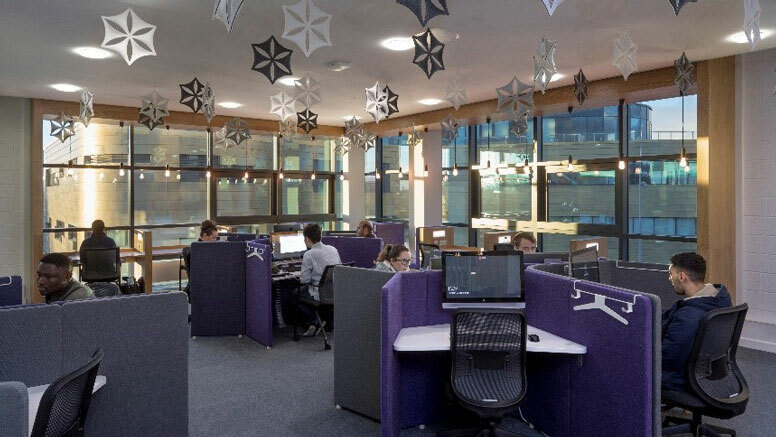 Floor 3 has a “winter” theme and uses winter-like themes such as ice-skating and snowflakes which are integral to the design of the spaces in these areas. Security and health and safety provision remain intact from the original building design and security is being enhanced. Much of the furniture is manufactured from materials that absorb noise to help with noise management. 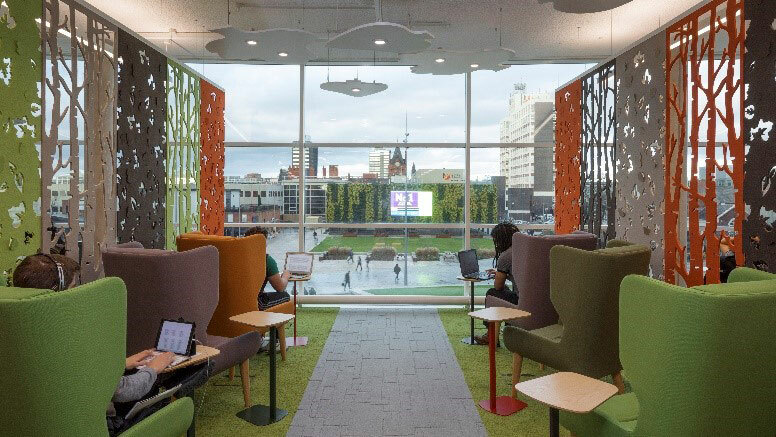 There are also noise reduction features built into the design of floor 1 specifically to help to prevent noise from travelling up the central atrium to the quiet space on floor 2 and the silent space on floor 3. All lighting has been replaced with energy efficient bulbs which operate on a PIR. This means that when spaces are not in use, the lighting is reduced. Assistive technologies are available to students and there are a number of height adjustable desks available on each floor. We went for an inclusive approach, using UDL principles, so some of these services are available to all students, although priority in some areas is given to disabled students. Mobile shelving provided by Brunzyeel Storage Systems.